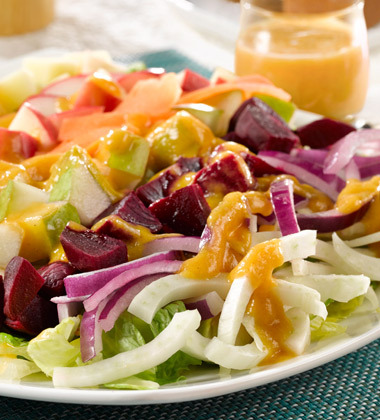 This fruit and root vegetable salad is delicious tossed with a sweet vinaigrette made with Campbells® Signature Harvest Butternut Squash soup. 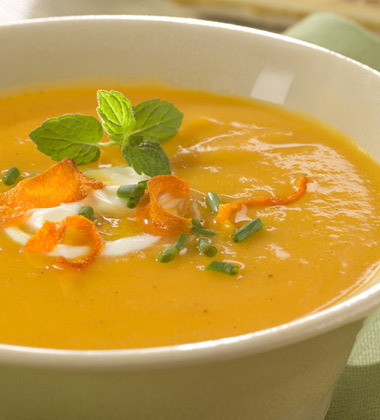 Rich butternut squash simmered with cream and a blend of warm spices including ginger, cinnamon and nutmeg. 1. The night before, place frozen Campbells® Signature Harvest Butternut Squash soup into refrigerator and allow to defrost. 2. To make dressing, place the cold soup in the food processor and blend. Slowly add oil, salt and pepper. radish, trimmed, thinly sliced	 2 tbsp. 3. Place romaine lettuce in large bowl. Toss with prepared dressing. 4. To serve, using tongs, portion about 1-1/4 cups (about 2 oz) romaine onto plate. Arrange garnish on top in strips similar to a Cobb salad as follows. Serve immediately. Use seasonal vegetables or what you have on your line to make this salad your own creation. Pair with a protein like poached salmon, sauteed prawns, or grilled chicken.